Phonebooks galore | Flickr - Photo Sharing! overloaded phone book recycle bin in my neighborhood. this was just a day or so after they were delivered. shows how close to obsolete they are. Ryan Price Media, pwenzel, and 7 other people added this photo to their favorites. holy crap, and it doesn't help that they are in plastic bags either. What is crazy about this photo is that you can tell that the next the books are going to be delivered because the city’s [Orlando] waste department rolls this cans out for a few days then they disappear again for 6 months. Last cycle I got 3 sets, one large and one small from each of the 3 companies competing in my neighborhood. They even upgraded the recycling equipment to take them with the newspapers too. Never seen a specialized bin like this. Most excellent for the Phone Book pool. Hi! Lea here from www.inhabitat.com, a blog focused on sustainable design and practices. 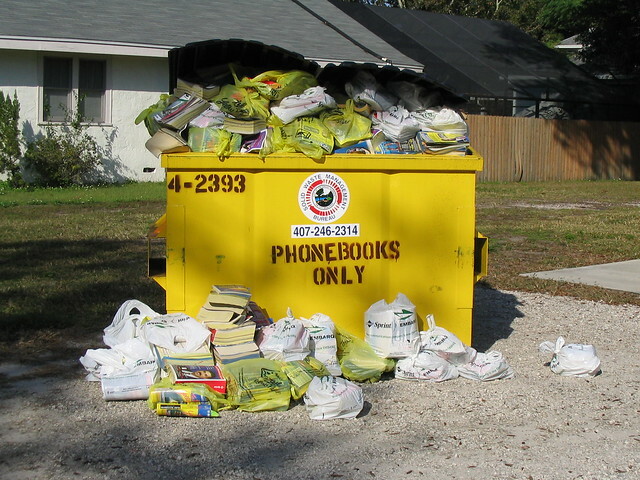 I wanted to let you know that your photo was credited on a post about phonebook waste. You can check it out here. I used your phone in a post! You can find it here. Interesting, I didn't know any hauler actually had a special collection dumpster just for phonebooks.